In the final analysis, we ask ourselves: would we be happy to be seen with this guitar out on a gig? And the answer to that is a resounding yes! Great looking vintage-meets- modern styling with Custom Shop quality tones and sporting sensible playability upgrades. Sadly, diehard traditionalists might take some convincing. The name John Page is synonymous with top-of-the-line guitar craft and design. Mentored by Freddie Tavares, who helped Leo design the Stratocaster, he worked his way up from Fender's shop floor to end up running the Custom Shop - the so-called 'Dream Factory' - which he helped set up in 1987. Page remained in charge for 12 years. And remember Fender's budget-but-cool Bullet range from the 80s, with its innovative metal pickguard and combined bridge? That was Page's doing, as were many other Fender innovations at that time. 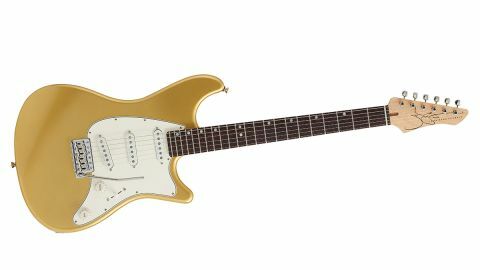 Move on nearly three decades, and John teams up with Howard Swimmer's HRS Unlimited to produce affordable versions of his hand-built models, including the Ashburn, as reviewed here, fitted with his range of Bloodline pickups. There's no disguising the inspiration behind the Ashburn. However, Page has used his experience as a player and a designer-builder to include improvements to the 'three single coil, bolt on' design. The alder body and maple neck are perhaps a given (ours has a rosewood 'board and, of course, maple is available), but Page has restyled his instruments to be more user-friendly and ergonomic than strict vintage models. "Re-imagining beloved guitar designs is often fraught with disaster. But we feel John Page has nailed it." Although the body is comfort-contoured in all the usual places, the traditional square heel is replaced by a sculpted affair, which offers greater access to an increased complement of 22 frets on a flatter 305mm (12-inch) Gibson-like radius. Further refinement comes courtesy of a genuine 'bolt on' design, where the usual hefty wood screws give way to bolts that locate into threaded inserts in the neck. Page says this affords superior neck-to-body contact and string vibration transfer - there seems to be some logic to this view. High-end parts include Gotoh's 510 vibrato bridge with push-in, tension-adjustable arm, and staggered tuners that obviate the need for clunky string trees. Finally, pickups are Page's own-design Bloodline single coils, a reverse-wound middle pickup rendering positions two and four of the five-way noise-cancelling, and the bridge unit - like the Fender Hendrix Strat - featuring what John describes as a "contrarian slant". This means the treble side is further from the saddle and should promote a less spikey tone. With its 22-fret neck and shallow fingerboard radius, the Ashburn's neck feels familiar - but not Fender-familiar. It's more like a cross between Gibson and Ibanez, or indeed if anyone remembers the Starfield instruments made by Hoshino (Ibanez) back in the early 1990s. In fact, the offset-dot markers look almost identical and the headstock shape is redolent of the brand, too. But that's no bad thing, as these were fine instruments but just didn't catch on. Ahead of its time, perhaps? Strapped on, the Ashburn balances beautifully and the top frets certainly are easy to reach. Medium frets lend the instrument an un-metal vibe, so the guitar's playability resonates well with its appearance and intent. The medium C-section handful melds seamlessly into the palm, while the matte finish is smooth and drag-free. No nasty surprises here, just a purposeful neck that lets the player get on with playing. With a Custom Shop Strat for comparison, we fired up the ubiquitous Blues Junior for a back-to-back comparison. Hand-on- heart, there were far more similarities than differences: the Ashburn is perhaps on the brighter side all round, but it's marginal, and with master tone as well as volume for all pickups, this is easy to tame. Anyway, it's sometimes great to have a real 'edge' there - think of Eric Johnson's chord work - and it's definitely a sight easier to lose a bit of top than it is to add it afterwards. All the signature tones are there - it works superbly with distortion, too - and there's nothing to suggest that one guitar was half the price of the other. Re-imagining beloved guitar designs is often fraught with disaster. It's so easy to come up with a pig's ear of a design, but we feel John Page has nailed it with his very likeable Ashburn. And considering his design heritage, we can't think of anyone with more of a right to do so. We love the quality Japanese build, too. Available in a range of great colours (which any vintage Fender fan will recognise), it looks like it's been around forever, and in many guitar lovers' eyes, the visuals are half the battle won. That this instrument goes on to perform with understated ease in both the playability and sound departments should win it friends within this admittedly hotly contested price bracket (not least by Fender itself). In fact, there's nothing not to like.